Happy Valentine's Day! I am not celebrating, but hope that all you couples out there had a romantic evening with your partners! This Saturday, I went down to visit my friend Kari in Izunagaoka. Our friend Josh was there as well, and we set out to have the most random adventures we could. 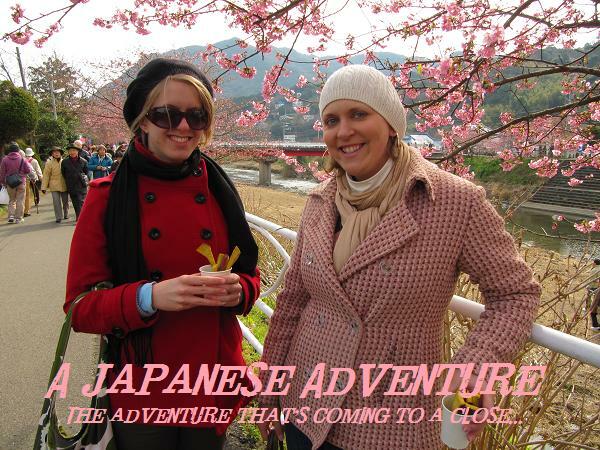 Well, our main goal was to see the early cherry blossoms in Kawazu as I said in my last post, but when I arrived, Josh and Kari proposed a plan to visit a boar amusement park. I reluctantly agreed, but the weekend conversation pretty much revolved around the boars from there on out. We went out on Saturday night to one of my favorite pork cutlet restaurants that is one of Kari's regular eating establishments. I got my usual katsudon and Josh ended up drawing the attention of an older drunk Japanese man who chatted with our table for well over an hour!! The conversation was quite random and hilarious. At one point he told Josh to be a rabbit and eat his cabbage so he could be a strong sportsman, funny since Josh really only plays video game sports...and then the conversation digressed as the man at one point told us that his farts smell like lemon. Josh asked him about the boar amusement park, and we found out our hopes and dreams for the following day were crushed. It closed about 3 years ago, but they are still handing out brochures because Kari had gotten one about a year ago. We were hoping the man was so drunk that he didn't know, but unfortunately after an internet search, that wasn't the case. The night was filled with randomness, including a free pen from the owners of the restaurant, free chocolates for Valentine's Day from the owner's of a really cool bar in Ohito with the walls and ceiling covered in album covers (and the bathroom covered in all women album covers....), and we capped off the evening watching some movie from Kari's childhood that she told us frightened her as a child, but was her brother's favorite video, so she was forced to watch it all the time...it was indeed frightening, even more as an adult!! This morning we slept in a bit and then headed further down the Izu peninsula to Kawazu. The cherry blossoms line the river and you can walk up and down the path. There are many vendors selling food and souvenirs. This first picture looks quite unimpressive, but I wanted to give you an idea of the bigger picture down the river. Here's a close up of some of the flowers. These cherry blossoms are much pinker than the regular ones that bloom later in late March and early April. Kari and I enjoyed some sweet potato fries from one of the vendors. It was a nice relaxing walk that indeed made me see the light at the end of the winter tunnel. Even though we're wearing winter coats and hats, the weather is starting to warm up little by little and the blossoms definitely give the feel of spring!! Unfortunately we did see quite a bit of snow up in the mountains on the drive there though! Also, one of the vendors that we bought dried fruit from was selling some boar!! Afte r narrowly missing out on the amusement park where they had trained boars to jump through hoops and had boar races, we had to at least eat some boar to make the weekend complete. Josh and I split a boar kabob for about $1.50 each. It was pretty tasty, but pretty much just tasted like beef. After the cherry blossoms, we made a short detour to Toi, another town on the west coast of the Izu peninsula. It boasts the world's largest flower clock at over 30 meters diameter. As the boar extravaganza was a no go, we had to settle for the clock. It turns out, we drove there pretty much for nothing as the clock is huge, but it isn't made of flowers anymore! There was a plaque about it's Guinness Book of World Records standing in 1991, but apparently they stopped making it out of flowers! It was all tile, and around it were a few barely still live flowers. They did however have a nice footpath around the clock that had some foot reflexology rock massage stuff. And here I am in front of the clock. Note the crappy flowers around it. Across the street from the clock was a foot bath. The Izu is known for it's natural hot springs, so there are many spas and many foot baths around. This one was nice after a walk around the clock with the rocks. Like I said, Happy Valentine's Day! I am off to get some sleep. This week is full of interview tests and essay grading. It's the end of the school year here, so the students are finishing up all their classes and getting ready for graduation in March!